August 2018 – Life Is Such A Sweet Insanity. I’m not a breakfast food kind of guy. Once in a while I’ll have pancakes or waffles, but generally I’m not into cereal or oatmeal. I will not eat eggs unless I have to, as I don’t care for eggs unless they’re used as an ingredient for something else. Earl is always patient with my food requests, and since the kitchen is his domain, I am grateful. 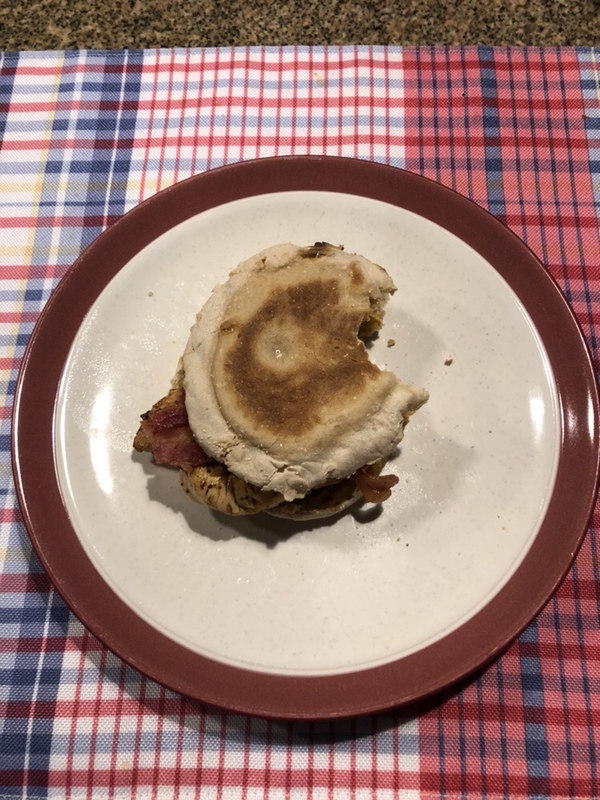 I enjoyed a nice chicken and bacon sandwich on an English muffin this morning. This was just what I needed to start the day. Low in Weight Watchers points, I’m finding myself feeling pretty good after this savory breakfast. I’ve mentioned before that I occasionally listen to Binaural Beats. For those unfamiliar, Binaural Beats are two dissimilar tones listened with headphones, which produce a third tone in your brain. It is said that these tones stimulate certain brainwaves and measured responses. Some use Binaural Beats as a “digital drug”; I like to use them to find focus and calmness, the latter as I’m settling in for a good night’s sleep. They’re best listened to when combined with music or white noise. Last night I fired up a couple of new downloads on my iDoser app. I fell asleep as the different audio tracks played for about 35 minutes. I was hard asleep before the tracks ended; I woke up briefly about an hour after falling asleep and took out my headphones. I then slept soundly for the rest of the night. And wow, did I have very intense, colorful, and vivid dreams last night! 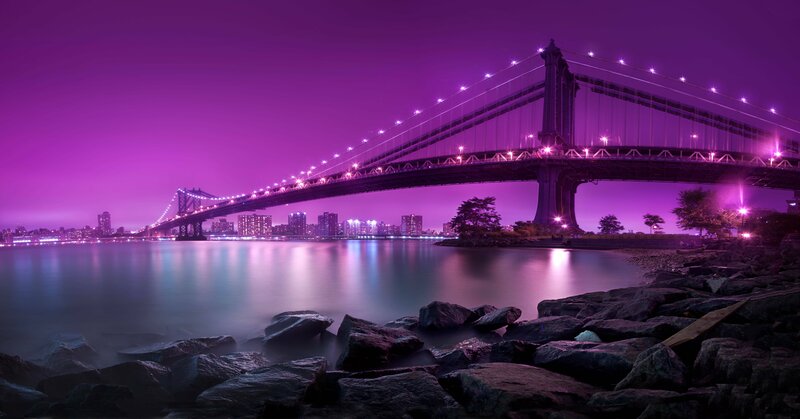 The content of the dreams are not important but the impression was one of happiness and euphoria. I have a lot of pressing deadlines at work, so I’ve been working extra hours and focused on the projects the team is working on. My dreams last night put it all in perspective, gave me a 20,000 foot view of life, and most importantly, helped me find my center of happiness. It’s good to regain a sense of balance in life. I feel like a million bucks today. I intend to carry this feeling throughout the day. Earl loves it when I make videos. Aretha Franklin, the “Queen of Soul”, passed to the next stage of her existence this week. She was 76 years old. 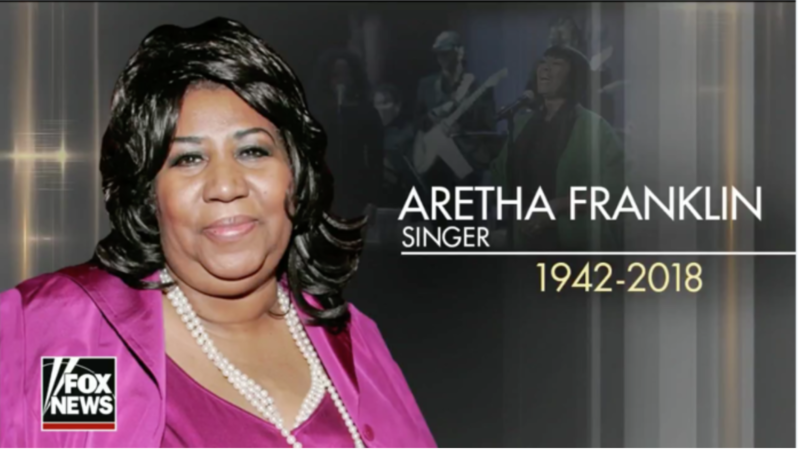 To commemorate her passing, Fox News featured Patti LaBelle in a montage dedicated to Aretha, because after all, they’re both… um… singers. (Look carefully in the background in this photo). While I have mentioned in the past that I wasn’t particularly a fan of her music, there’s no denying that she a was very talented woman who brought much joy to millions of people over a career that spanned decades. I never knew what the hell she was growling. “Flip pop the top baby, you’re as cool as an inner tube, this better than cinnamon seed”. Just because I don’t understand her lyrics doesn’t diminish her artistry. She did have a lot of soul. May she rest in peace and bring joy to the other side as her spirit lives on. So I don’t talk about work a lot here on this blog. I usually speak in the vaguest of terms so that nothing can be held against me in the future. But the truth of the matter is, I work for a Fortune 500 Technology company. Said company has its roots in traditional telecommunications; at one time it would have been called “the telephone company” (but it’s not THE telephone company that Ernestine worked for). I’m the Lead Developer and Staff Manager of a team of nine very capable individuals. Seven of them work for the company and two of them are off-shore contractors working on projects along with the core team through the end of the year. Our official team moniker includes “Tools and Automation”. We write web-based applications to bring a cohesiveness to very dissimilar software applications in use throughout the company. Our tools touch all parts of the company: service and support, order processing, order entry, and communicating with third party providers. It’s a very challenging position with some wonderful opportunities. Our automation and tools make an impact to literally thousands of employees in the company, which in turn improves the customer experience. Writing this makes me realize that I indeed feel like I’m making a difference. The company has endured its ups and downs over the years. Budgets are occasionally leaner at point A on the timeline versus what we can do at point Z. However, the company tries to make working a pleasant experience within the confines of budgets. We now get an extra week of vacation at three years instead of the traditional five. Tech start-up niceties have been installed in the offices; nicer cafeterias, ping pong tables, and the like. Many have an option to work from home. There’s a strong “remote employee” culture as well; I’m one of the folks who’s official office is actually at home. The company also focuses on Employee Engagement. Every quarter, a handful of employees are recognized as “MVP Employees”. With the award comes a cash bonus and an extra day of vacation. I was selected as one of the MVPs for this past quarter. It’s nice to be recognized for the work I’m doing as well as the work my team is doing. For all the extra hours that are worked, for the moments of accomplishment and the moments of frustration, it’s a nice feeling to be recognized by the leadership team. In a particularly pressing time in the realm of deadlines and expectations, it was quite nice to receive the recognition. It was the morale boost I needed. I once again feel like I can conquer the world. 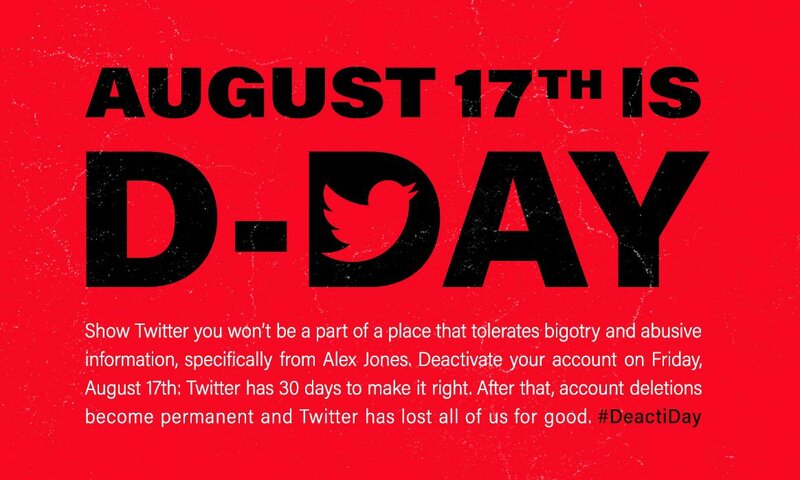 Lifehacker has a wonderful article about what’s going on with Twitter these days. 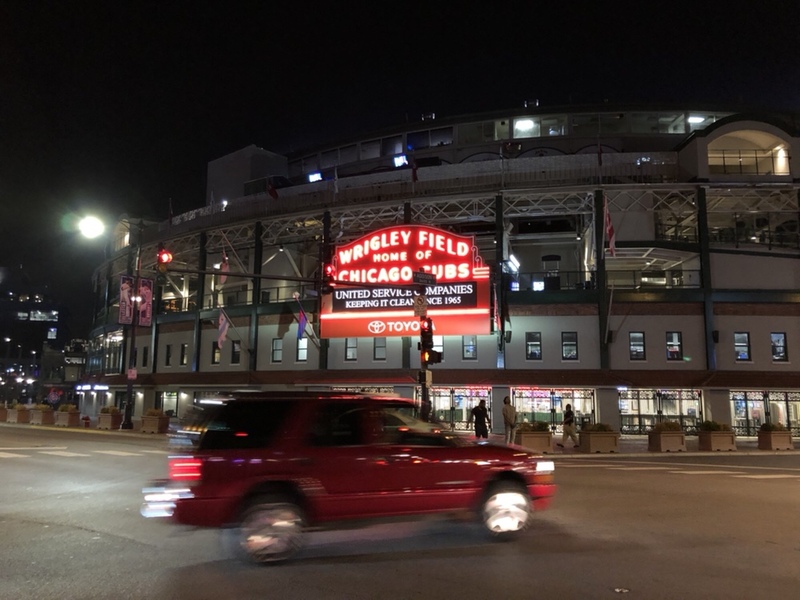 We are wandering around Wrigleyville at 10 til midnight. Administrative: That Line Has Been Disconnected. As I continue to cut ties to Twitter, I realised WordPress pushes new post notifications to my main Twitter account. This will be the last blog post that does this; no blog posts after today will post a notification to my Twitter feed. If you’re using Twitter for notifications of updates to my blog, you will no longer see these notifications. I invite you to continue and stop by to visit, follow with your favorite RSS client, or sign up for email notifications through the various buttons scattered about the site. This blog turned 17 years old earlier this month. I have no intention of slowing down my efforts around here and honestly, with the distraction of Twitter removed from my life I may get back to more frequent updates. I’m inviting folks to click the “Tell Me Something Good” link at the top of my page to leave a comment that spreads good news with the world. I think we need more of that. And as always, please be kind to one another. Thanks for stopping by. The dumbing down of America is never more obvious than when folks try to use an apostrophe in their prose. After they look up the word prose to understand what it means in this context, folks begin throwing apostrophes around with unbridled abandonment in an effort to segregate letters they feel do not belong together. Below are some examples of the proper use of the apostrophe. For those wondering what an apostrophe is, it’s sometimes called “the single quote” or as one woman once said in my college sophomore level English class, “the comma in the air”. The frosting on the cake is chocolate. Therefore, the cake’s frosting is chocolate. Since there were actually two identical cakes, the cakes’ frosting is chocolate. You could say the cakes’s frosting is chocolate, but not a lot of people do it that way. Many members of the Edwards family attended the reunion. There were many Edwardses. There were many Edwardses at the Reunion of the Edwards. There were many at the Edwards’ Reunion. Many members of the Kennedy family went down to the Cape. There were many Kennedys. There were many Kennedys at the vacation home. There were many people at the Kennedy’s vacation home. Mr. and Mrs. Voss had many children. They were the children of the Vosses. They were the Voss’ children. Mr. Jones has a car. It’s Mr. Jones’ car or it can be Mr. Jones’s car, but it’s NEVER Mr. Jone’s car, because the car belongs to Mr. Jones, not Mr. Jone. The cat has food. It’s his food. Actually we don’t know if the cat is male or female, so it’s its food. It is a wonderful day. It’s a wonderful day. Be a hero with the zero. Heroes gives zeroes the ‘es’ they deserve. Everyone has their own journey. One of the cool things about being human is we are each unique. No one else in the entire universe will experience a moment the same way you do. We may see the same things, but we don’t feel the same things. Only you truly know your own feelings. I was watching TED Talks while working today. Most of my TED Talk viewing selection is based around the responsible use of technology, especially when it comes to Internet Privacy. I enjoy educating myself on how much we compromise our privacy when we opt to go for the latest and greatest gadget experience. Education makes us better. I had finished a video when another was suggested. The cover snap included a tall, smiling woman who had a positive energy emanating from the screen. The title was intriguing, “I’ve lived as a man and a woman — here’s what I’ve learned”. The speaker was Paula Stone Williams. I’ve included a locally hosted link to the video at the top of this blog post. As the title suggests, Paula speaks to her experiences as a trans woman from the perspective of not transitioning until later in life. She has plenty of first-hand knowledge to compare how society behaves towards men and women, specifically white men and white women. Her candor, storytelling style, and honesty made this a fascinating video for me to enjoy. I consider myself fortunate that my soul feels mostly comfortable in this vehicle I’m using for this round of incarnation. Not everyone has that experience, and it’s important for us to educate ourselves about the journey of others, at least as far as it can be shared through storytelling. Learning about others gives us insight and perspective. In a time when many are content to live within borders and their own little silo, perhaps it’d be better if we stepped outside and learned a bit about those around us.